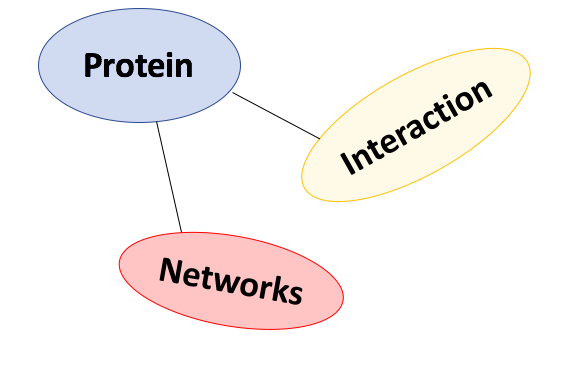 Protein interactions are essential for any process from cell-to-cell communication, gene regulation and more. Networks exist to enable us to identify how proteins interact with one another in various processes. This is important especially for identifying potential drug targets and better understanding how a malfunctioning protein may cause a disease. Databases like String, IntAct and Biogrid allow us to visualise interactions. 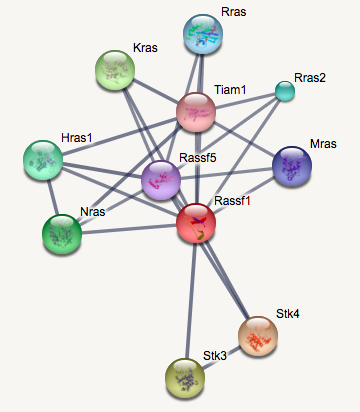 Below I have used String to show the interactions of RASSF1A and other proteins. The circles are the proteins with the line between them showing confidence in the interaction by thickness. What proteins does RASSF1A interact with? The proteins circled in blue are all annotated to be involved in the regulation of cell cycle. The proteins circled in yellow are all annotated to be involved in the positive regulation of protein serine/threonine kinase activity. The proteins circled in red are all annotated to be involved in mitochondrion transport along microtubules. ​What proteins does RASSF1A interact with in mice? There are only three primary proteins which interact with RASSF1A in both mice and humans which are Stk3, Stk4 and Hras. These three proteins have been annotated to be involved in activating the MAPKK pathway. Incorrect activation of the MAPKK pathway is a necessary step in the development of many cancers, including prostate cancer.